If you are looking to tidy up your working space, making it more user-friendly, then knowing what you need to do and how to do it is going to make your desk organization easier to manage. A cluttered desk wastes lots of time looking for the right information, or a distraction to what you need to concentrate on and not worrying about the other stack of work. You can’t do something well if you are jumping from one task to the next; having an organized desk can stop you being distracted by other tasks that you need to finish. The most important action you must take first is to remove everything off your desk; you can’t organize a mess, you have to start with a clean slate. Only put back on your desk items, which you use every single day. If you don’t use them daily then there is no place on an organized desk, find them a permanent home of their own. It is important to check the items on your desk regularly, I find that sometimes things can creep on to your desk without you noticing and they then start to add to the clutter. I personally don’t use paper trays, I found they were an attraction for clutter, if I have loose paper on my desk then these are the pieces which I am using, everything else has a file and is in that file, if I need these during the day I have them in my diary. The less that you have out on the surface of your desk the more organized you will look; keeping a tidy desktop is just part of your desk organization. Once you have a clear working desk top, you have to look at the rest of your desk to ensure you have the right storage for your items to keep you organized and don’t lose important information. If you are not storing items on top of your desk, then you must have the facilities to keep them organized on the inside. There is nothing worse than the look of a tidy desk, because when you start looking for a piece of paper and you have to pull out so many files because you have no system, makes the concept of keeping things off your desk a waste of time. Working out how you work is the first step that you need to take on keeping your office drawers and cupboards in order. If you club things together, make sure that you are filing the items in the right place. Using labels and tags makes identifying a lot easier than hunting through piles of files for just one item you are looking for. I am not one for spending money so I like the simple option, a paperclip in my diary indicates the current day, this is the only place I use one in my diary and it works. Finding a simple solution to your problems isn’t difficult, what is more difficult is ensuring you continue with the desk organization, don’t let the paper pile up cluttering up your working space. The final thing that you must do before leaving your desk is to tidy, turning up to start work when your desk’s piled high isn’t conducive to getting your day starting in the best possible way. Therefore, if you are looking for ways to have control of your desk, then you need control of what goes on top of it and how you put items away on the inside, too. I know it is a constant battle but you need to win regularly, to keep it under control. If you are looking for more articles on this topic head over to the landing page where you will find links to other posts on organizing. I really learned something from this post. 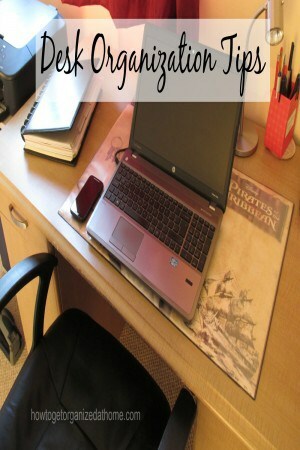 Lately I have been struggling with desk organization and clutter keeps re-appearing. Your tip for getting rid of the trays was great because they were holding clutter that could be filed away. Thank you for the great tip! Great tips. I need to find ways to stay organised! It definitely is a constant battle. But as you say it’s important to keep on top of things. This is what I do wrong, organised for a while but I let things slip, grr! Annoys me. I need this post! And probably every other one you’ve written! My lack of organizational skills is legendary. And it keeps the whole house in constant chaos.